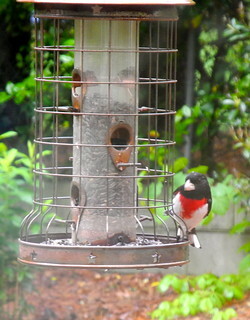 A rose-breasted grosbeak. Might be the first I've ever seen--I certainly had to dig in the bird book to decide what he was. My Atlanta bird list says they are "common" in spring and fall (one step down from "abundant") as they migrate through. Very handsome bird, indeed. I'm glad to add it (well, the male, anyway) to my "will know on sight" list. One thing I envy you eastern birders about. You seem to have a much more interesting and larger variety of birds than we do out here (same goes for trees). He's a handsome fellow, and that's a terrific photo.